Vacation rental house. Sleeps 2, 1 bedroom, 1 bathroom. Cats, Dogs allowed. 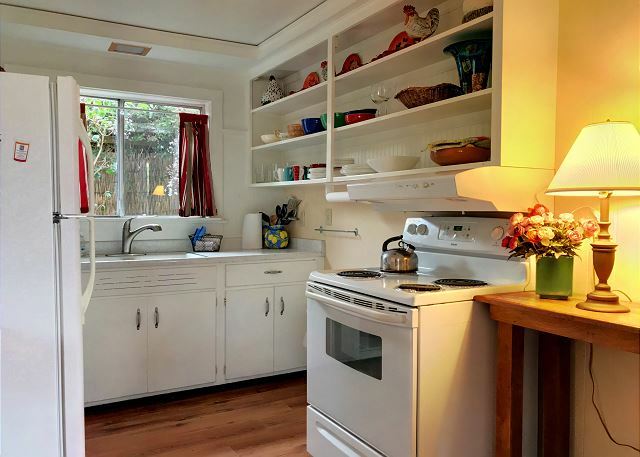 Stocked Kitchen as well as a Patio w/ BBQ for cooking up the local catch of the day. Come and enjoy your time here! 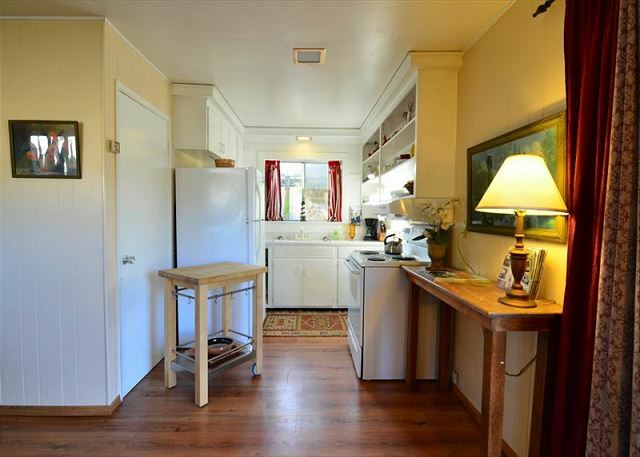 Seaside Cottage is in a perfect location to start your exploring...Short drive to redwoods, hikes and trails. Watch the Video.... Seaside Cottage on YouTube Located on a quiet street, this cute and cozy private cottage includes a full kitchen, bedroom, living room, and a full bath. 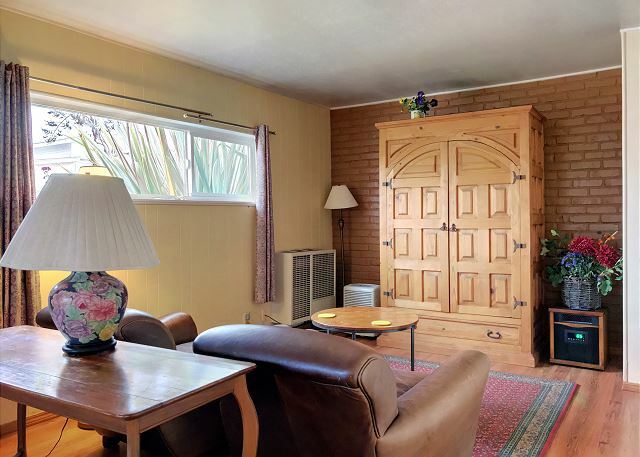 Enjoy all of the conveniences of being right in town and a short walk to shopping, restaurants, and cafes, while at the same time being able to walk to many beaches and parks. 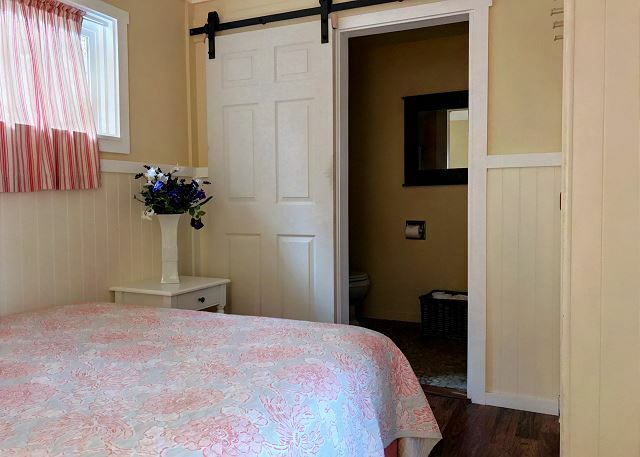 The cottage is nicely decorated and comfortable, making for an enjoyable and relaxing vacation that’s easy on the budget! 30 night minimum stay. 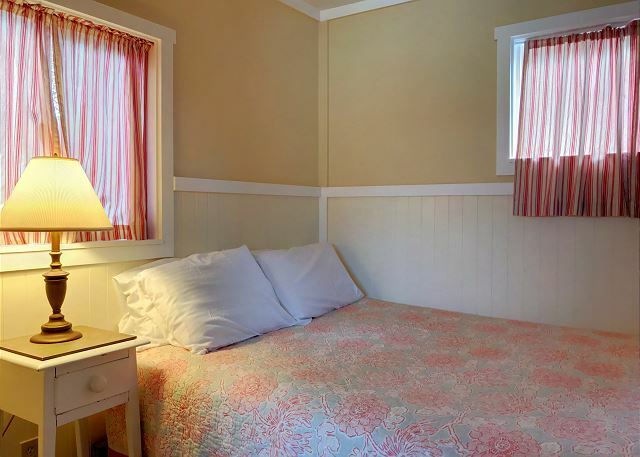 The cottage is basically a large studio but you can use the privacy curtain between the bedroom and living room. Kitchen is nice and it's great being able to walk to so many things from the home. Pet friendly too! Two blocks to shopping, cafes, and two different parks, and the entrance to Trinidad State Beach which is a state park and has miles of trails going to beautiful College Cove Beach and Elk Head as well as Trinidad State Beach. You are also about a block from the lighthouse looking south along the Pacific Ocean, Beaches, and Trinidad Harbor and trail down to Old Home Beach and about 4 blocks down to the large Trinidad State Beach. Every 30 day booking has a $120 cleaning fee, which will be renewed for every consequent 30 day booking. We do come in every two weeks and change linens and do some light cleaning. We will automatically add this to your booking. The cottage also has a nice little yard with outdoor seating and a charcoal BBQ. Note- This home has wifi only. Long term tenants are welcome to connect own cable if needed. Not the best time to visit for someone from Fl. Very rainy the first two weeks. Great location and nice simple walk to great locations for hiking and pictures. Would like to alternative dates and rental prices. Would rent this place again. We always have a wonderful experience at Seaside Cottage. It meets our needs perfectly. Thank you for being a return customer with Redwood Coast Vacation Rentals. We always look forward to having you stay with us. I stayed here in November, so maybe it was a bit during the 'off' season. However, it was a super quiet home on a quiet street. Very clean house with practically everything you could need. It was bigger that I thought from the photos. Management was easy to contact and helpful. I'd definitely stay there again on another trip. Clam Beach was a short drive away and was pristine, great for walks/runs. Of course, everything is walking distance in Trinidad. Oh, and if you need a laundry mat while you stay here, try McKinleyville off the Clam Beach exit. They also have a dog parlor (Muddy Paws?) that lets out-of-area people do self-wash. You'll probably need that if you bring a four legged friend to Clam Beach. Awesome hot water and water pressure too; I hadn't expected that. Thank you for your stay at the Seaside Cottage and I am so glad to hear that the home worked out so well for you. Clam beach is a great place to take dogs and I am glad to hear that you enjoyed Muddy Paws; it is a favorite place for many log lovers in the area. Trinidad is such a charming town and this cottage is definitely in a great location for exploring. We thank you for booking with Redwood Coast Vacation Rentals and we do hope you will return to visit again in the future. I really enjoyed the time I spent in the cottage. The location was perfect just a short walk to the beach and Trinidad is a lovely and comfortable area. I was very much at home in the cottage which lent itself to relaxing and recharging me as I worked through the week. The bed was comfortable and the kitchen had everything needed to prepare anything I wanted. Only thing amiss was no washer and dryer or bath tub which is great to have as a long term renter. I would recommend this rental. Thank you for the review, Sharon, it was a pleasure having you stay at the Seaside Cottage. It is a cozy little place, but as you mentioned, the location is perfect for a short walk to the beach and Trinidad. If only it was a little bigger, maybe there would be room for a washer and dryer and tub, but unfortunately it is too small. I do hope we will get the chance to see you again. Thank you for staying with us. Great place for retired couple for long term stay. We enjoy it every winter. Thank you for your recent stay and for your patience with a few little problems. Luckily easily remedied problems. We always love having you and we look forward to seeing you again! This cottage is the perfect spot for the grandparents' long term visit to the family in the area. Thank you for the review of the Seaside Cottage and for being a return customer. We always look forward to your stay and can't wait to have you back again. We were very warm, comfy & cozy on an extreme winter-weather weekend @ the coast. We enjoyed shopping & walks around town and on beach w my dogs despite the rain because location is central to all. Complimentary coffee & local beers were a nice surprise. Couch is aging & could use update/cover and kitchen needs a large pot for boiling pasta/seafood(sold @ the market) & new cutting boards(protect counters - easily replaced/hygienic). We arrived during a storm, left during a storm & had a GREAT time in between. Other family members stayed in Redwood Coast Vacation Rentals for our gathering this weekend & seemed as pleased as we are with their stays. We hope to join you again next year. Merry Xmas & Happy New Year to you all. My family enjoyed their stay there. Thank you for booking Seaside Cottage with Redwood Coast Vacation Rentals. We hope you will stay with us again soon . this was a great place to come with out dog. She is a well behaved girl, and we brought her bed, so having her enjoy the walks on the beach was fantastic! Thank you for the review of Seaside Cottage. It is always a treat to be able to travel with our furry friends; I know I hate to be away from mine. Seaside cottage is the perfect little place for some time away. Thank you for your stay and please visit us again. The house was located right in Trinidad and was a perfect home base for exploring the coast. It had everything that we needed for a weekend stay. We were able to walk to the two wine tasting rooms in Trinidad, walk to the grocery store and walk to dinner. The weather was perfect and we enjoyed some time outside sitting in the yard. Seaside Cottage is the perfect little getaway spot. It has all the basics that one would need, and within walking distance of pretty much the center of Trinidad, to the beaches, and amenities. Thank you for staying with us, and we look forward to having you visit again. Cozy little cottage perfect for two people and our 4 legged fur babies. Directions were clear, easy to find and convenient. It was a short walk to the market, a couple of little shops, places to eat, the beach and Trinidad Head. The house was small but was perfect for two adults and our dogs. The small, partially fenced yard with chairs was nice for sitting, visiting and having coffee. The kitchen was equipped with pots, pans and dishes which we used and it was nice having a leisurely breakfast there. The bed was comfortable enough and plenty of warm blankets. It was quiet in the little alley and we enjoyed a nice peaceful stay. The couch wasn't super comfortable and could use some updating but that would be my only complaint. For the price, I wasn't expecting anything super luxurious. There were some movies and board games and a few tv channels but we were mostly out and about. The WiFi didn't get a good signal at first when connecting as described in the (very nice) informational binder that was provided, but the property manager was easy to contact and vey helpful and we had no issues after speaking with her. The local beer in the refrigerator was a nice touch. We would definitely stay there again. 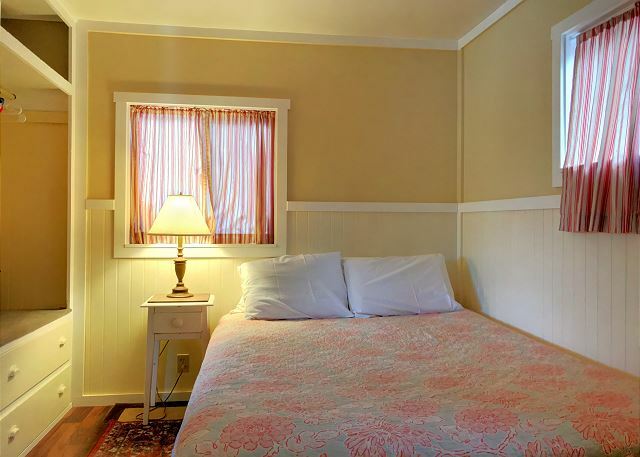 Seaside Cottage is cozy and convenient, offering the basic amenities. Being pet friendly is definitely one of the main perks. I am glad the cottage worked well for you and your fur babies. It is definitely a plus to be able to travel with them. Thank you for your recent booking and Redwood Coast Vacation Rentals would love to see you again. 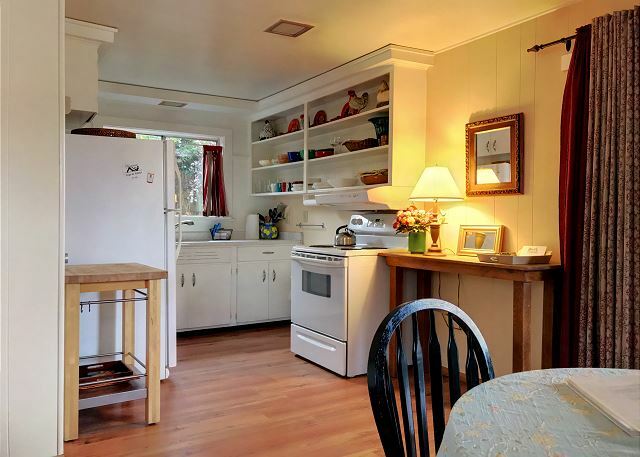 the cottage was spacious, clean, and within walking distance from the beach. A perfect getaway! I am glad the Seaside Cottage helped provide you with the perfect Getaway! Redwood Coast Vacation Rentals thanks you for your recent stay and we hope to see you again! A nice, clean, quiet place for one or two. Thank you for your recent stay at the Seaside Cottage. My husband and I stayed here after our wedding and it was a perfect retreat. The cottage has so much character and it is well maintained. The complimentary coffee and cookies were a nice touch and the locals in the area were very welcoming when we arrived in the neighborhood. The location has great access to town and it's just a short walk to the ocean. Congratulations on your wedding. 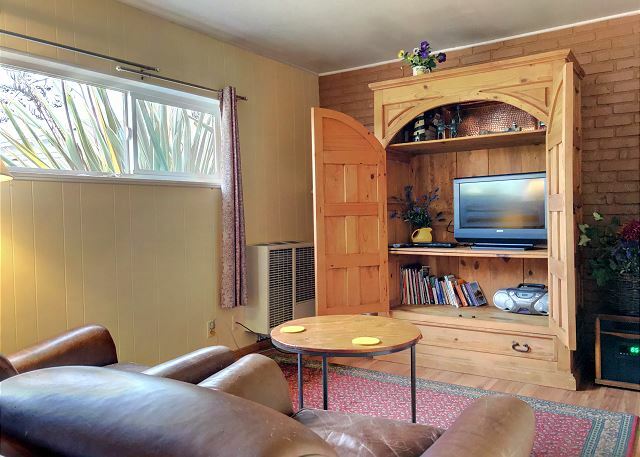 I am pleased to hear you came to Trinidad to visit and stayed in one of Redwood Coast Vacation Rentals cottages. The Seaside Cottage is just the perfect little place for anyone wanting to be within walking distance of the shops, ocean and sight seeing. I am so glad you enjoyed our local treats, as well. I hope visiting Trinidad will become a tradition for you and we would love to have you here again. The cottage is in a quiet alley, close to a number of food choices. We had everything we needed. Husband appreciated the stater coffee. Clean and comfortable bed. Would stay here again. Thank you for taking the time to leave a review of Seaside Cottage. Glad you had a relaxing time and we look forward to having you as a future return. Cottage was well-maintained and clean. Nice linens. Small bathroom with shower, no tub. There are no scenic views from inside the cottage. Management company left a basket of brochures about local attractions, which we appreciated. Cottage is located near the end of the block so it is only a short walk to the street and just beyond that a little park with a replica lighthouse. It is an easy walk on the street to the harbor and an attractive beach. Like most towns on the northern California coast, the houses are above beach level. The trip down and back is not too steep for comfortable walking. There is a restaurant at the pier that is open early and rather late into the evening. I saw two more restaurants within walking distance of the cottage. There is one grocery store in town but no laundromat. This cottage is good for a low stress vacation and we enjoyed being there. Thank you Brent, for such a detailed description of your stay at the Seaside Cottage. I am glad you had a nice stay. This is definitely a perfect rental for a low stress vacation, as it is so close to so much by foot. Redwood Coast Vacation Rentals thanks yu for your stay and we do hope you will return to visit us again. This little Seaside Cottage was just right. The size is very cozy and close to everything Trinidad has to offer. We started out each day with a stroll to the beach with our dog. The cottage itself is clean and is decorated very homey, the fresh flowers were a nice touch. Seaside Cottage is definitely little and cozy, but has just what is needed and close walk to everything. Thank you for the review Helen! I hope you will visit us again! We had a wonderful stay at the Seaside Cottage. The house is perfect for 2 people, it was very tidy, and the beer was a nice surprise. We will definitely consider staying at Seaside Cottage again. Thank you for the review of Seaside Cottage. We are pleased you had a wonderful stay and we hope you will return to visit us again. It was just what we wanted. Small accommodation but with all the necessities in a perfect village. Thank you for staying at the Seaside Cottage. We look forward to seeing you again! I loved my experience renting this vacation rental. The cottage was clean and welcoming and the fresh flowers and local beers were a nice added touch. I would definitely recommend this company and rental to my friends and will use them on my future visits to the area. Thanks, Tami! We hope to see you again and thanks for recommending Redwood Coast Vacation Rentals to your friends! We have over 60 properties of all shapes, sizes, and locations throughout Humboldt to choose from! 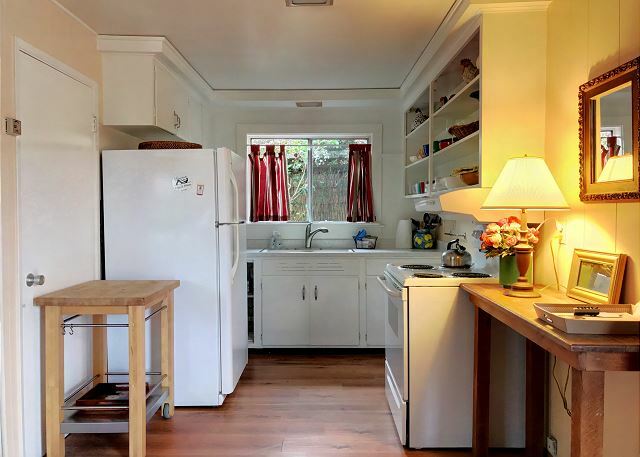 Cute rental home in a beautiful, quiet location. We were steps away from the beach and the heart of town. The cottage itself was cozy and had everything we needed for a comfortable stay. 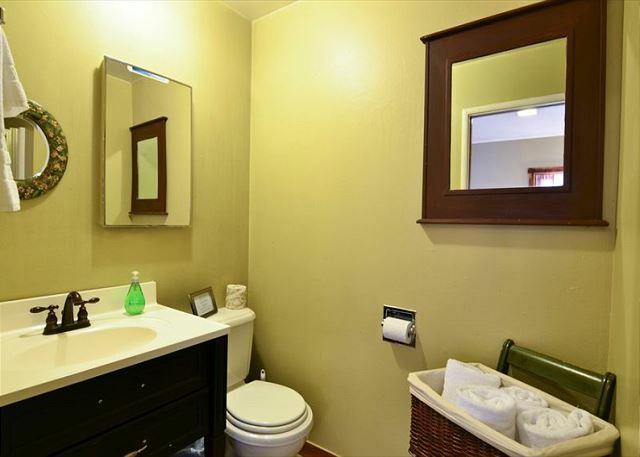 Well maintained, great layout and all amenities needed. The wi-fi was not 100% reliable, but the management was informed and did their best to get it up and running. We would plan to stay here again and would HIGHLY recommend. Seaside Cottage truly is perfect for the getaway vacation. cute, cozy and just right for the adventurer! Please come again to the Cottage with Redwood Coast Vacation Rentals! Perfect for two, very cozy, all necessary amenities. It worked out well for us. We are familiar with the area and stayed in Trinidad for the first time. Everything you need for some simple cooking. This cottage is perfect for two! Please stay with us again when you come to visit family in the area! We enjoyed walking, hiking and eating without having to use the car in the vicinity. Folks in Trinidad are friendly and helpful. The instruction book was great and the wine a nice touch! Thanks. Thanks for coming to Trinidad and having such a nice time here with us at Redwood Coast Vacation Rentals! Please visit us again at the Seaside Cottage! This cottage in the middle of Trinidad is absolutely perfect, especially if you're looking for a place to bring your dog. We thoroughly enjoyed our stay. Was very quaint, clean, and perfect for our family vacation. Bring your family anytime! Thanks for appreciating the town of Trinidad and your sweet accommodations with Redwood Coast Vacation Rentals!! Cottage location was perfect for exploring many beaches, enjoying restaurants in town, and driving to the Redwoods and nearby Arcata. Loved Beachcomber Cafe (definitely fav in Trinidad). Walked to many beaches and experienced an awesome sunset. Loved Trinidad and cottage was very comfortable, clean and quiet. Would definitely stay here again. Wonderful! Hope to have you back again with us at Redwood Coast Vacation Rentals - we now have over 60 vacation homes in the area from cottages & studios liike this one, to cabins, condos & 5 bedrooms homes from Crescent City to Ferndale and Eureka including Trinidad, Arcata, Willow Creek & the Redwood National Park in Orick. This was a great space for myself, my husband and my mom. You can walk to almost anything in Trinidad. Being on the alley it was very quiet. We did quite a bit of cooking in the kitchen, which was well set up. The propane grill outside was nice, too. The sofa bed would have been too soft for my taste, but my mom was fine with it. Also you have to walk through the curtained "bedroom" to get to the bathroom so if you're more than two people and concerned about privacy this wouldn't be the best, but it worked just fine for us. We didn't get the key box code beforehand but the rental company was helpful on the phone when we called. Thanks for enjoying your time in Trinidad and finding you cottage comfortable and complete with everything you need! We hope you book again with Redwood Coast Vacation Rentals on your next vacation! PS we have tried to figure out a door instead of a curtain, but the configuration of the walls just won't let it work! We Loved this place! Very cute and quaint on the inside. It does not look like much from the outside, but the inside was decorated very nice. and I loved being in town to walk to the beach and restaurants without driving anywhere. We did not cook, but it looked like the kitchen was well equipped. The only thing lacking was a hair dryer. Samantha of property management was extremely pleasant to work with. We would definitely stay again. We did wine tasting at both of the wineries in town and had dinner at the Lighthouse which was very good. First time renting a private property instead of staying in a hotel and my husband and I were very pleased.Cottage very clean,good water pressure,bed was comfortable,driveway for car and a great location.The only issue we had was connecting to the wifi.Connection could only be made in the kitchen with the iPad or cell phone sitting on counter near window.Although this was a slight inconvenience, we would definitely stay here again should we come back to the west coast.We had a wonderful trip and staying at the Seaside Cottage was a big part of it.Thanks! Pleased you had a great first experience! I will go hit reset buttons for internet. Please feel free to call about any issues, even if a minor inconvenience, and we will do our best to fix it during your stay! wine and a beautiful vase of flowers for us! "away from it all," or longs for the fresh ocean breeze and soothing sounds of the surf. Absolutely, can't wait for a return visit! This cottage is perfect for a couple desiring a get-a-way weekend, especially if you want to bring your "babies"! Thanks for choosing Redwood Coast Vacation Rentals and hope you will visit us again! We had a nice stay at this property. Everything was clean, nice location, just a short walk to the beach. Would stay again. Pleased you had a nice stay. It is lovely the beach is so close! Please come again to the Seaside Cottage with Redwood Coast Vacation Rentals or on of our 50 other properties!! We had a wonderful trip to Trinidad CA to celebrate our 36th wedding Anniversary January 28, 2014. The Seaside Cottage was perfect for us providing all we needed to be able to stay comfortably, sleepm shower, cook or eat out as we choose to do. Trinidad is a wonderful area with lots to do all around. The property management company was helpful and professional. We will be back! Congratulations on your 36 anniversary and thank you for choosing Seaside Cottage with Redwood Coast Vacation Rentals as your celebration hot spot! Please come see us again for the 37th! It was such a cute, cozy place that had a great beachy feel. Even though you drive down an alley to get to the cottage, it was really quiet and we felt really comfortable. A really nice walk to the beach and the town is so cute. The only thing we recommend about the house is a curtain for the kitchen window. It faces the back yard of the front house and at night, you can see right into their house, which means they can probably see you too. The option to have that curtain open or closed would be nice. We had such a great weekend and will be coming back to stay at the Seaside Cottage. Thanks for loving the place! As for the privacy screen, we just cleared vegetation and replaced the screen as the plant life had damaged it. The Jasmine will grow back quickly this spring and make a more permanent block! Please come visit us again at the Seaside Cottage with Redwood Coast Vacation Rentals or one of our 50 other properties! We had a wonderful time. The initial impression of the rental is not perfect, but the location and the town are fabulous if you want beauty and peace. The rental, which is a sort of mother in law behind the main house, is very comfortable, the fridge and bathroom were spotless! There was an unpleasant odor when you first open the door which went away with airing it out a bit. The bed is very comfortable and overall for the price the place is a gem. It all was exactly what we were wanting, beautiful beaches, magical forests and quiet tiny town. Loved it! Thank for your review and the cottage is perfect for the couple looking to enjoy the majestic of the redwood forests and the ocean beaches. As for the odor at arrival, we have done recent upgrades at the cottage, including clearing out vegetation around the outside and installing a new ventilation fan in the bathroom. But as this is a winter issue, we have concluded that the sun is at such an angle now that the cottage isn't getting those rays to keep the cottage as fresh as in the other seasons. Fortunately, as you said, it quickly dissipates when activity begins inside. Thank you for noticing the details and cleanliness in the bathroom and kitchen. Please come visit us again at the Seaside Cottage at Redwood Coast Vacation Rentals or one of our 50 other properties! Disappointed in Eureka hotel options led me to this gem! Great loaction; cute small town with a grocery store, shops, & restaurant was all I needed. I'm a younger woman traveling by myself for business, I felt extremely comfortable here and after spending a few days in Eureka, was very pleased that I didn't end up in Eureka! Since it's less than 20 miles from the Redwoods, I was also able to squeeze in some hiking in the evenings!! Trinidad is a GREAT little town, close enough to Eureka/ Arcata heading south and the Redwoods, heading north. Loved it so much I'm going to plan on a personal trip to Trinidad! I had travel delays & other things I needed to discuss/ ask the rental manager about, she was always extremely friendly and answered her phone right away. Customer service was outstanding. Home was well furnished and clean. Glad I chose this rather than a hotel/ motel room! Thanks Jessica! Having a house or a cottage is always a great option other than a motel room and I'm pleased that you were pleased! Come see us again at the Seaside Cottage at Redwood Coast Vacation Rentals or any of our other 50 properties! We were just at Seaside Cottage 1 night due to a schedule error on our part. The management was most accommodating for us. 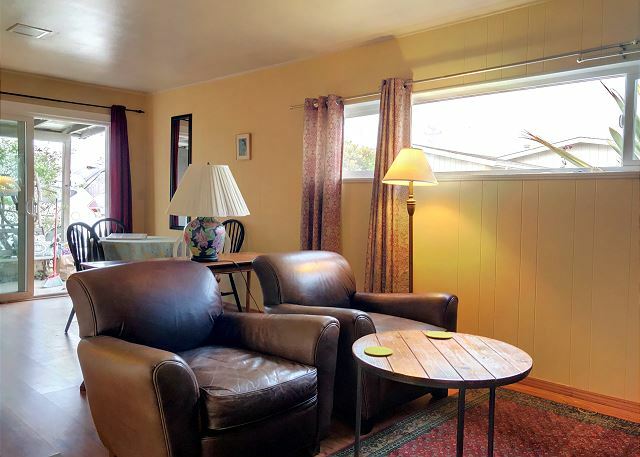 The cottage is cute, terrifically located and comfortable. It would've been more comfortable if the windows and slider had screens. When I asked, I was told "we don't have bugs" but we did have a flies "bugging" us. The curb appeal as we approached the front door could have been neater if the stoop had been swept. Every window had cobwebs around it. The place was well stocked, the bed comfortable and the wine and flowers appreciated. We will look into getting screens, especially on the slider. Glad everything else was pleasant! Felt comfortable, safe, and had everything needed to explore Trinidad and surrounding areas. We were getting married on Moonstone beach that weekend and had lots of boxes of decorations at the house and felt totally comfortable. Our dog felt right at home and had fun with all the new smells. Affordable and just what was needed as a home base for a busy long weekend. Slept well and was very quite away night. Congratulations! Our area is quite popular for a wedding destination and we are glad you chose our beautiful beaches for your celebration and that this little cottage accommodated your needs. Hope to see you again at Seaside Cottage with Redwood Coast Vacation Rentals or any of our 50 other properties! The welcoming bottle of wine and bouquet of flowers were wonderful touches of your area in Trinidad. We have said over and over that your Alley really WAS so quiet. Maybe because we were there on Tuesday and Wednesday nights. We loved the Beach because there was a Sea Lion there experiencing it's "Catastrophic Molt". Very educational. We slept like babies. Very comfortable cottage. Thank you! excellent. She was very helpful and understanding. Wow! Kudos to Samantha. We look forward to having you back to the Seaside Cottage or one of our other 40 homes in Trinidad, Arcata, Eureka, Orick & the Redwood National Park, and now even Crescent City! Trinidad is a great location for exploring the redwood coast. The property location was literally an alley, but it was a great size for 2 people and had everything we needed to have a very pleasant experience - good value. Thank you for appreciating the value in the Seaside Cottage. Trinidad was just voted best attraction in Humboldt County. Redwood Coast Vacation Rentals hopes to have you back! Peace and quiet, everything we needed, walking to eat was easy. Rain most of the time but we still enjoyed our stay there. Bed needs a topper. Everything we needed was there, very clean. Happy Anniversary! Glad you spent it at one of our homes. Yup, we just got a new comforter after your stay. Hpe to see you again with Redwood Coast Vacation Rentals! Cozy cottage was a perfect getaway and so close to beach! Had a wonderful family weekend in Trinidad for $95/night. We loved it and would go again. Glad you enjoyed your stay at the Seaside Cottage and yes, we are going to do a few improvements including some touch up paint and carpet cleaning in the next week or so so that it works for all who stay there. This cottage was just right for our vacation. It was just a few minutes to walk to the beach or the grocery store, but we were also pleased with the quiet and privacy. The decor was charming, it was impeccably clean and the kitchen was a little gem. Lovely property, right around the corner from the ocean, walking distance to the store, bottle of wine idling on the counter waiting for our arrival.....what's not to love!?! All in all very, very satisfactory. No problem at all. thank you all. I love the fact that the cottage was homey and ecclectic. It was perfect in a unique way that made my husband and I very comfortable. Although there is no ocean view it only takes a short enjoyable walk to the Trinidad beach. Restaurants, and shops are also not far. I would defiantly stay again. Quiet, Cozy, Comfortable and Reasonably Priced. We enjoyed our stay very much and would consider booking the Seaside Cottage again in the future. Thank you, Doug. Great to have you guys back! We stayed here for quite a while and loved every minute of it. The ocean and the trails surrounding this property are amazing. The local eateries as well as shopping you cant pass up! I will stay here in the future again for sure! Cute little cottage near everything Trinidad has to offer. The bed sagged a bit to the center, but contributed to my wife and I staying cozy in the cool fall temps on the coast. Note that the internet is wireless and apparently has a daily limit. Once you exceed the limit, you are cut of for the rest of the day. that shouldn't be the case. u must have been on wrong wifi. there is no limit. We really enjoyed our stap at this cottage. It was nice when the agent brought us an additional heater. Would have been nice to have door on bedroom. Couldn't get radio to work. Need new sofa-bed. Otherwise, cute little cottage. Love Trinidad. Will work on the door and did put in a new mattress for sofa bed as your suggested. Thank you! Cute, clean, quiet, private, recently refurbished, just steps to town center. Enjoyed the Seaside Cottage and will return. The hide-a-bed needs a queen size mattress cover, currently has a double size that does not fit. Very relaxing weekend. Thank you. Purchased the new queen size mattress cover per your suggestion. Look forward to having you back! 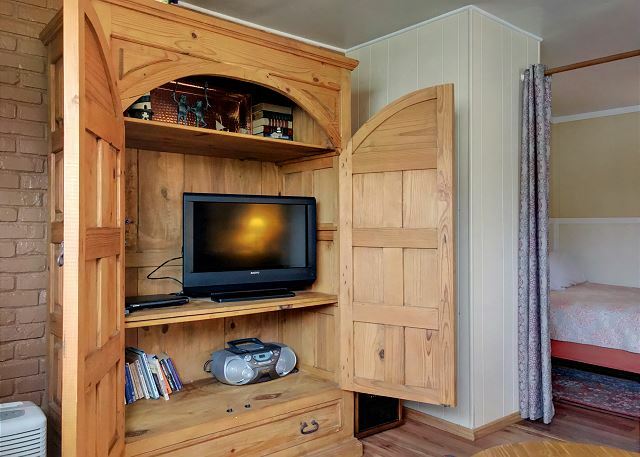 As others have commented, the cottage is nicely decorated inside, clean, and nice for a couple. But for the money it should have a better mattress! It's saggy and worn out and only accessible from one side. It would be such a nicer place if the owners would replace it and also create some nicer outdoor area to sit with a table and a couple chairs. the cleaning fee is excessive given the tiny place. The manager Mike is nice and had good suggestions for hiking in the area, and was quickly responsive to an internet connection problem we had. Trinidad's a great place and there's not much available for two in the area so I guess that's why the rates are on the steep side. We've traveled a bit and the Lost Coast is one of the nicest places to visit if you like the natural world and a tranquil vibe. Mattress has been replaced and we put up some nice outdoor seating and are in the process of putting up a privacy fence as well. Thank you for your input. This place is charmingly decorated, and located on a quiet street within easy walking distance of the market, cafés, and the water. Reservations are easy and convenient. The only thing to be aware of is that the bedroom is separated from the living room by a curtain, not a door... So our night-owl teenager kept us awake, then we woke him up in the morning. Not a big issue, but good to know in advance. Small & Quaint - around the corner from the best view in the world! The bed was too soft and it needed an arm chair in the living room, otherwise was very nice for a couple and I loved being in Trinidad, an absolutely beautiful place. We liked that the local and good market is walking distance. Good location. My only frustration was the lack of internet access. Overall, it was a very nice place to stay. Clean, quiet, & even when I lost the key on a Saturday night, the problem was taken care of easily & very fast.....great service!! the phone didnt work to call out at all. not even locally, yet we recieved telemarketing calls during our stay. Our stay was very enjoyable and the cottage very clean and nice. Cute little house w/convenient location; too bad the entrance is from the alley. Front is unattractive, but it is deceiving as the inside is darling. From management to housekeeping, we were treated like old friends. Great location for one with pets--we have two small dogs and the alley location provided a safe environment. We will be back! This is my second visit to this charming little hideaway; this time simply to decompress. 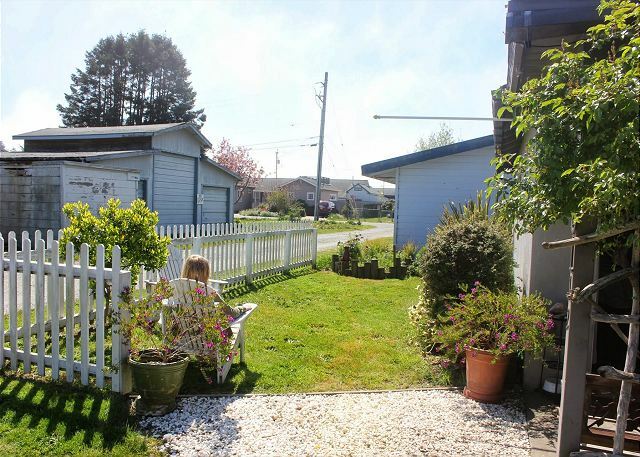 Affordable, tidy, cute, in town but wonderfully quiet and only blocks to the ocean. I'll be visiting again...year round. We'd been looking for a vacation home, and the owners were very helpful. We had a small ant problem (we'd left some honey out), and the internet connection wasn't as good as we'd hoped; but we were hoping to unplug, so it worked for us. I loved the fact that it was in the center of town; we could walk to everything we needed. I would definitely recommend this place to my friends. We loved staying at the seaside cottage with one MAJOR exception: Both of the beds we nearly unsleepable. We have decided that while we plan to rent again in the future, we will bring an air mattress to lay on the floor to sleep on just in case they haven't replaced the matress on the bed(s).